Discussion in 'BlackHat Lounge' started by lakim0, May 4, 2013. I don't know how many of you celebrate this amazing day, but I want to congratulate Christians all over the world. Once again, we've seen it! 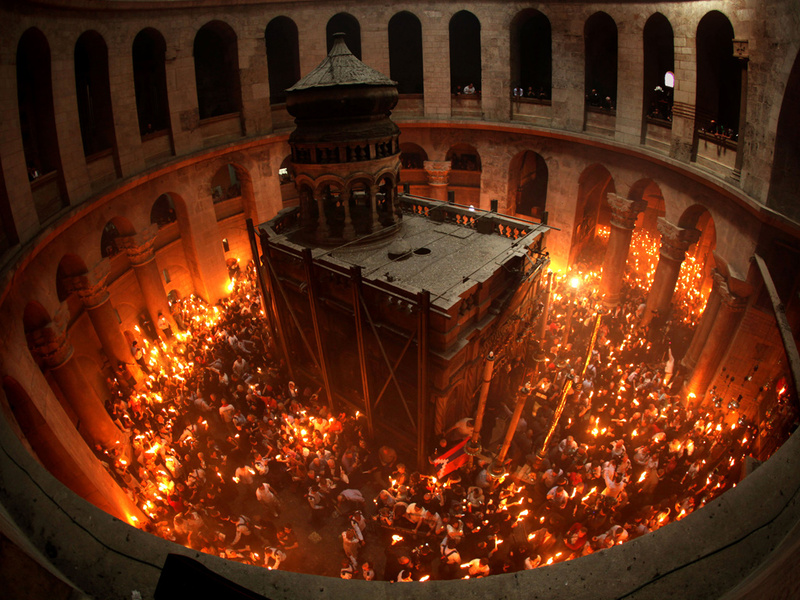 The Holy Fire (Greek á¼‹Î³Î¹Î¿Î½ Î¦á¿¶Ï‚, "Holy Light") is described by Orthodox Christians as a miracle that occurs every year at the Church of the Holy Sepulchre in Jerusalem on Great Saturday, or Holy Saturday, the day preceding Orthodox Easter. It is considered by Christians to be the longest-attested annual miracle in the Christian world. It has been consecutively documented since 1106 A.D., with previous references being sporadic The ceremony is broadcast live in Georgia, Greece, Ukraine, Russia, Romania, Belarus, Bulgaria, Cyprus, Lebanon and other Orthodox countries like Egypt. Furthermore, the Holy Fire is brought to certain Orthodox countries, such as in Georgia, Greece, Russia, Belarus, Cyprus, Serbia, Montenegro, Bulgaria, Romania, Moldova, Ukraine, Syria, Lebanon, Jordan and Macedonia, every year by special flights, being received with honors by state leaders at the respective airports. Never heard of that, do you really celebrate it yourself OP? Every year a head priest from a specific Christian faction gets in there, prays and when he comes out he holds light that sprang from the cave. Before he gets in he gets thoroughly searched by the priests of the other factions to minimize the possibility of scam (basically they despise each other so theoretically they have motive to reveal a scam). Sure, I'm an orthodox christian. Thanks for replying and congratulations again. For Those Who Are Celebrating This Guys. So it's a day about celebrating fire? It's the day before Easter, always. The most important Day of the Year for all Christians !